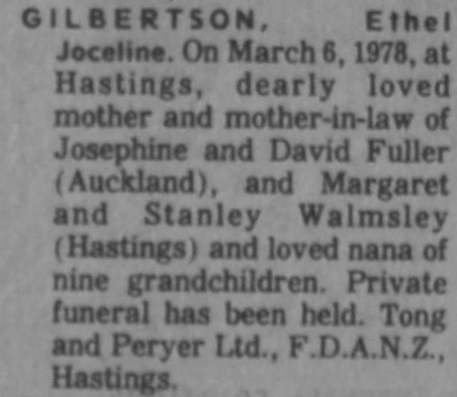 On March 6, 1978, at Hastings, dearly loved mother and mother-in-law of Josephine and David Fuller (Auckland), and Margaret and Stanley Walmsley (Hastings) and loved nana of nine grandchildren. Private funeral has been held. Tong and Peryer Ltd., F.D.A.N.Z., Hastings.